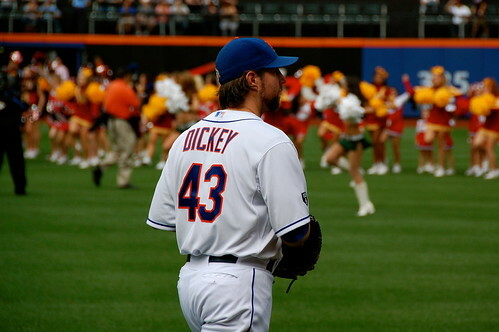 I try to make one game a year at Citi Field, and this year’s happened to be at the end of the season when very little was on the line other than seeing R.A. Dickey pitch for win No. 19. When I planned to attend this game during our trip to New York with Nik, we had no idea who might be pitching, but we got lucky that Dickey was on the mound. 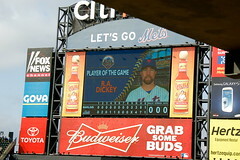 For a dismal Mets season, Dickey, along with Johan’s no-hitter, has been one of the lone bright spots. 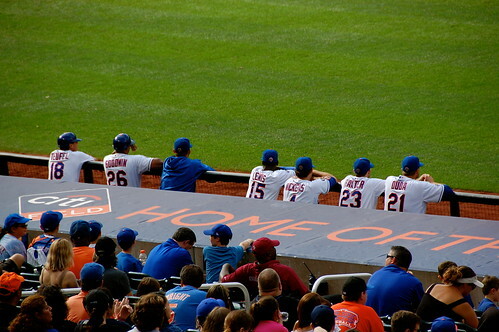 Some of my fellow bloggers have had the opportunity to get special access to pregame player interviews, batting practice and press conferences before and after several Mets games. 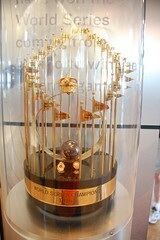 Knowing that, I took a chance and reached out to the Mets office to see if they might be able to accommodate me with something similar. 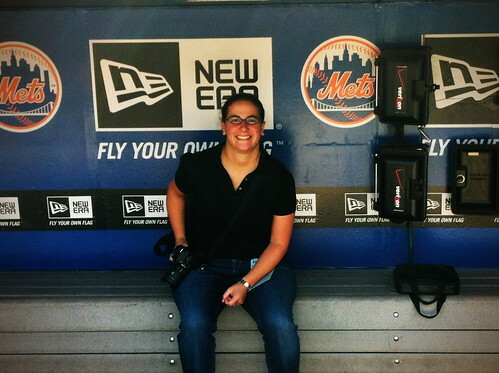 Shannon Forde* of the Mets Media Relations Department was incredibly kind to grant me a field pass for the Saturday game against the Marlins. There was no batting practice since it was a day game after a night game, so I relished the opportunity to walk on the field and capture the scene around home plate and the Mets dugout before the first pitch. 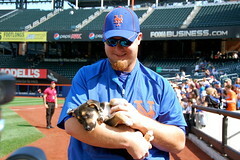 There were many events taking place around Citi Field that day, most notably Bark in the Park, where fans could purchase special tickets and bring their dog to the game and sit with them. 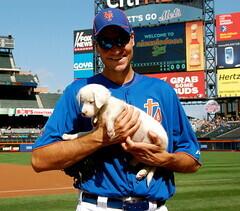 A portion of the ticket sales benefited the North Shore Animal League. 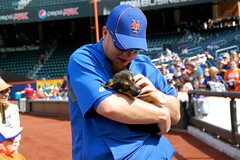 Several pitchers were on the field for stretching, autograph signing and puppy holding! 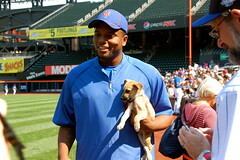 The players and pups were super adorable. Other highlights from pregame included finally meeting Ellie, sitting in the dugout and just generally enjoying the sunny day at the ballpark. The game itself was great. Good friend and fellow blogger Coop hooked us up with her tickets in section 138. 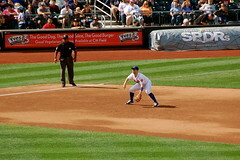 We spent about two innings there before moving to stand behind first base. It wasn’t because of the view, but rather the 50 cheerleaders in attendance that couldn’t stay seated for more than five minutes. I ate the Pat Lafrieda filet mignon steak sandwich, and oh my goodness, was it delicious. 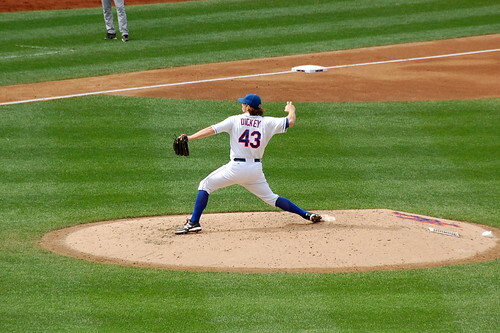 Dickey cruised through the game and almost hit a grand slam. 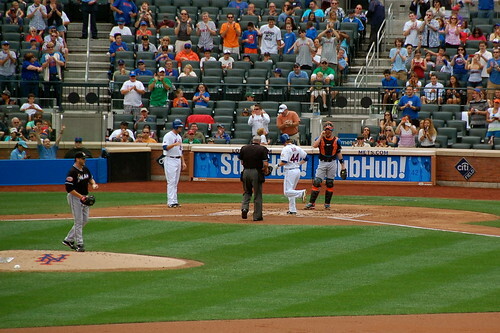 Jason Bay and Scott Hairston both went deep. Jon Rauch made it interesting when he came in, but ultimately closed it out. 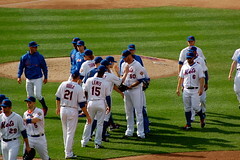 The Mets won 4-3, and Dickey got the win to move one step closer to No. 20. 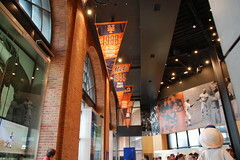 Following the game, we stopped into the Mets Hall of Fame. It was my first time in there and it was very nice. Great displays and many images from throughout the years. 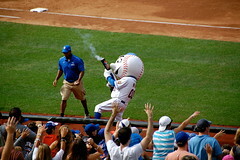 The season is coming to a close, but I hope I don’t wait until the end of next season before I get back to Citi Field. 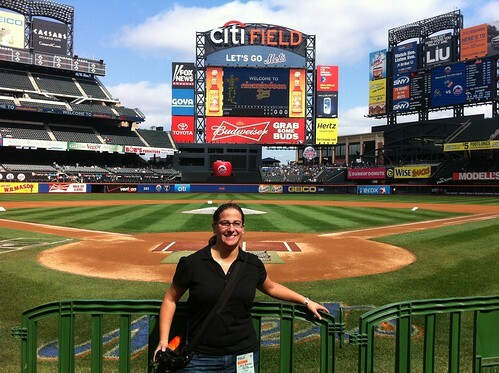 *I didn’t get the chance to meet Shannon or her colleague Danielle Parillo since there were numerous other events taking place at Citi that day. Since my day at the ballpark, it has been revealed that Shannon is battling Stage 4 breast cancer. To help offset the medical and other expenses her family will face during treatment, a fundraiser will take place Thursday, Nov. 1. 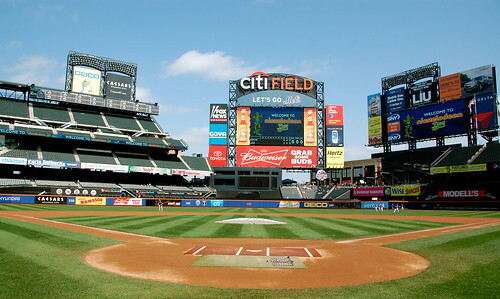 Many former Mets will be involved, and Ron Darling will be the MC at the event. Please visit http://www.hopeshinesforshannon.com/ to see how you can help.